I didn’t realize this was a lyric from a song, but who doesn’t scream on a hot summer day, “I WANT ICE CREAM”! I have had this recipe since the 70’s and it is so quick and easy. Who doesn’t want desserts that are quick and easy to throw together when company’s coming. I’ve made this with regular ice cream and this time, I made it with a Light Blue Bell Vanilla. 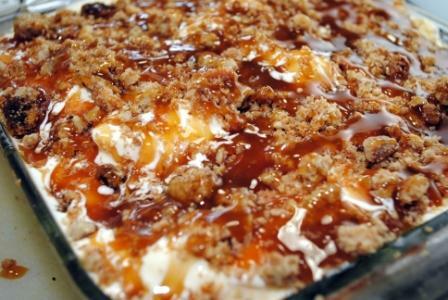 This recipe has everything that most people like -crunchy texture, vanilla ice cream, caramel and nuts. Every time I hear an ice cream truck I think of living in Kansas City. There was a little girl in our neighborhood that would go screaming all the way home “ice cream man”…… if she heard or saw the ice cream truck in our neighborhood. She’s all grown up now and I would imagine she still loves ice cream and I’m sure she still remembers the ice cream man from our neighborhood. 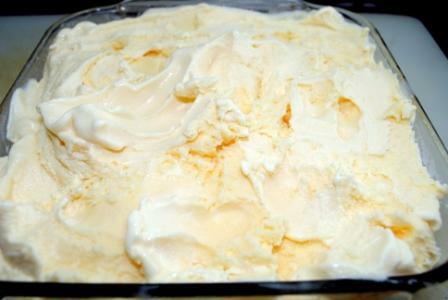 We are already up in the 90’s in our part of Texas and this will be in my freezer so on a hot summer’s night, we can pull it out and have a bite of cool, refreshing dessert. I think you will agree with me after you try this that it’s delicious. 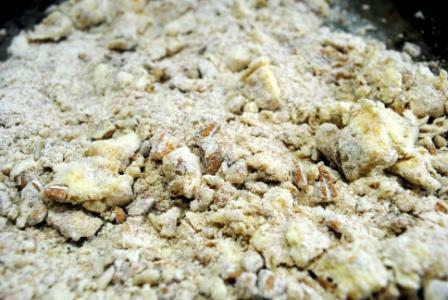 A little sugar, nuts, butter and flour makes a wonderful crunch to this dessert. Everything crumbled together, put on a cookie sheet and ready to bake in the oven. 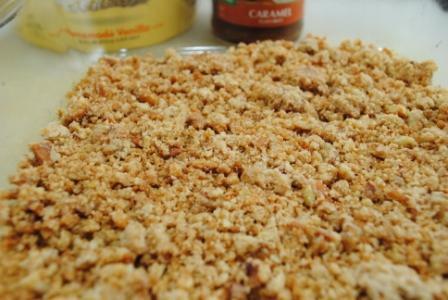 After it is baked, crumble the mixture, reserve one cup for top and press the rest into a pan. Soften the ice cream and put on top of the crunchy layer. 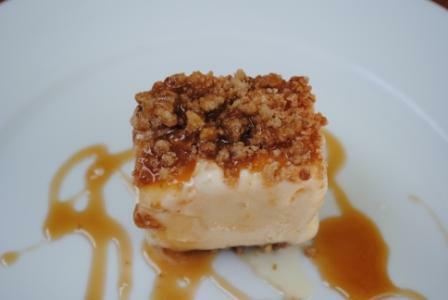 Then top with reserved crumb mixture and caramel sauce. 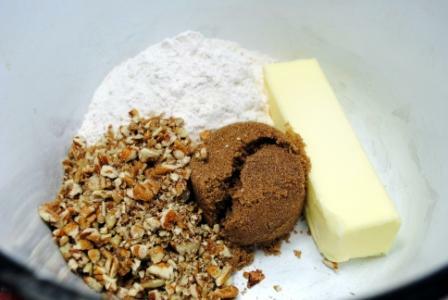 Mix first four ingredients and spread on an ungreased cookie sheet. Bake at 400° for 8-10 minutes or browned. Cool. Crumble in bowl and set 3/4 cup aside. Press reaining in 9 x 13″ pan. Drizzle 1/2 jar of the caramel sauce over this and freeze 45 minutes. Softened the ice cream and spread over the frozen layer of crumb mixture. Sprinkle remaining 3/4 cup nut mixture over this and drizzle withremaining caramel sauce. Cover adn freeze 24 hours before serving. I’m a dessert lover and this is the best. Ice cream has always been a favorite, but this is so much more than just an ice cream dessert. Summer is here and this is a must!! Caroline, I have been making this recipe for about 30 years. One of my sister’s favorites and ours too.